Just wondering, but is there still anyone who surfs the World Wide Web without using "tabs" on their browser page? 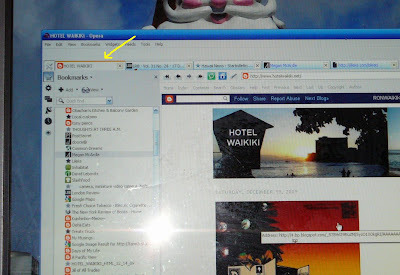 While using Opera below, the first tab (yellow arrow) is active which is my homepage, while the four other tabs to the right are on standby with four other websites already loaded. If a given webpage takes forever to load up, I simply switch to another "tab" and check back later on the slow poke site. If by chance you're unfamiliar with "tab browsing," you might want to enlarge the photo. I think I would absolutely lose my mind if we couldn't tab, but it doesn't stop there. You see, multi-tasking is a sickness. The symptoms are at least 3 browsers open with each having at minimum 5-7 websites loaded/loading. This obviously works better for those who have a speedy connection, but for me, I just go and tend to the mutton in the oven or go out to beat the cra* out of the carpets when things are la-dee-da-ing on the internet. Rowena- I was under the impression that everybody uses tab browsing already, but for some unknown reason, perhaps just a topic to blog about, I began to suspect that some people out there don't tab browse. Anyways. Rowena- geez, how many browsers you have open?? Only one for me. I wonder if IE6 has tabbed browsing? A lot of people still use that in corporate environments because their company has programs they use for business that won't work on newer version of IE. I feel bad for them when Microsoft drops support for IE6 in 2013 (approx.). I tend to use one browser at a time with at most 6 tabs open, and usually that's when I want to view original articles from Google Reader or click links in Twitter. Sometimes I open two browsers when I want to have both GMail accounts open at once, but I've been using desktop email clients to handle that lately. My daughter just taught me how to do that this summer and it's such a convenient tool. It's great that you're teaching everybody, Ron. Yes - my husband does not use the tabs!!! It drives me nuts! It's because it's a work laptop, and software that he runs for work is not compatible with the higher grades of Internet browsers that allow for the tab system...so he can't upgrade. Stinky. I guess Ann just answered my question about IE6! Brad- oh, I forgot that I always have AOL open running in the background for my Email, so that's 2 browsers. Generally I use tabs to listen to YouTube music videos, which plays even if the YouTube tab isn't the active one. Kay- coming from a retired educator, that's a real compliment. The moment Firefox unveiled tab browsing it was so instinctive from the get go, and I said to myself, "is that why everbody raves about it." "Oh." Ann- I guess tabless browser is there to discourage workers from using the company laptop for personal business like reading the newspaper online. Still doesn't make sense though in this day and age. Chad's workplace actually blocks outside websites, so no Facebook or personal email accounts can be accessed...unless you have a Blackberry! Ann- Hey, how about taking along a portable mini hard drive, then? But might forget it on the subway.